Did you know there is an entire floristic kingdom almost exclusively found in South Africa? It’s called “fynbos,” the Afrikaans name meaning fine-leaved. In Afrikaans, “y” is pronounced as a long “a”, so “fynbos” would sound like “fain-boss”. Fynbos is also the name of an ecological biome, confined almost exclusively to South Africa. During our trip we saw several plants endemic (found exclusively in) to the fynbos of South Africa. A number of fynbos plants belong to the genus Protea, also known as sugarbushes. These beautiful plants are quite varied, having nectar-rich flowers and beautiful bracts colored pink, red, yellow, and/or orange. Unfortunately, I’m a very long way from being a botanist, so I was totally overwhelmed by the plant species we encountered. I had enough difficulty with the new bird groups with no counterparts in North America. I cannot identify the species of protea these birds are feeding on. One species of bird did put on quite a show for us on the third day (August 27), however, the Cape Sugarbird. I was able to get enough photos of this bird to warrant its own post. As you might expect, Sugarbirds feed on the sugarbush plants. They are relatively large, larger than the Sunbirds, being 10-17 inches long, including the tail. 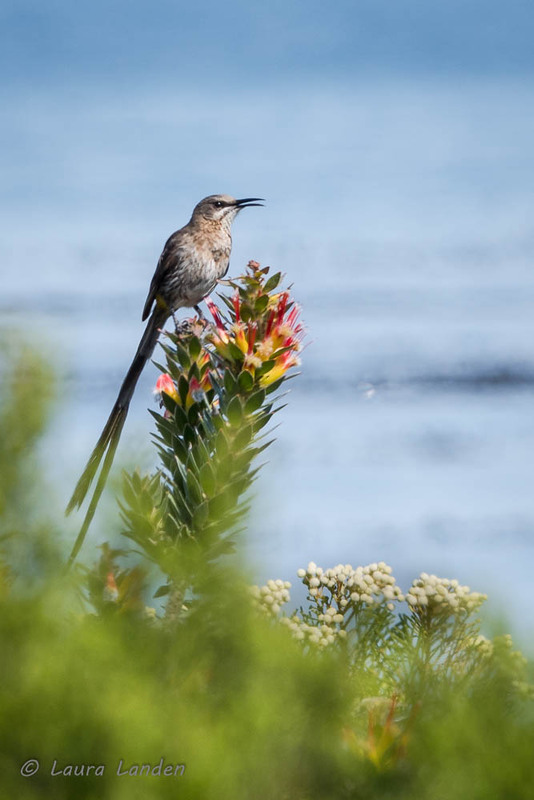 There are only two species found in Southern Africa, the ones we saw being Cape Sugarbirds. 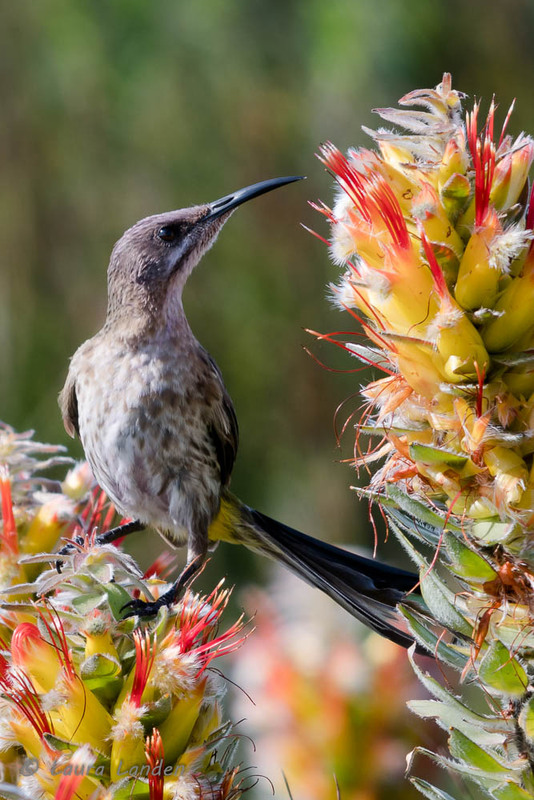 This species is endemic to the fynbos, feeding almost exclusively on proteas and associated arthropods. No hummingbirds are found in the Eastern Hemisphere, so Sunbirds and Sugarbirds fill the same ecological niche, feeding on nectar and thus pollinating the nectar-producing plants. Male Sugarbirds have very long tails, with some variety in the length. The one at the beginning of this post fared well in this regard. Males will fly up and make a remarkable display, flapping their wings and clattering their tails. Apparently females find this attractive, for various studies have found that longer tail length yields greater pair bonding success, but not necessarily greater reproductive success. Those wiley females sometimes mate with shorter-tailed males in addition to their longer-tailed social partners! We saw two males, one with a longer tail and one with a shorter tail. Also hopping around and begging for food was a juvenile. Enjoy this series of images of Cape Sugarbirds.